Hakea actites, Wallum Hakea, is a small to tall shrub with a lignotuber. The leaves are cylindrical, light green, up to ten centimetres long and crowned with a sharp point. The flowers are in axillary clusters composed of 1-6 white flowers. Blooms appear from May to September when they are both conspicious and profuse. Flowers are followed by woody fruits that are egg-shaped, wrinkled but without warty lumps and containing the usual two winged seeds. H. actites occurs from coastal south-eastern Queensland to just north of Coffs Harbour, northern NSW. The species is often found growing in swampy situations. This makes H. actites a useful plant to grow in domestic wet areas. The prickly foliage this would provide shelter and nesting sites for small native birds. 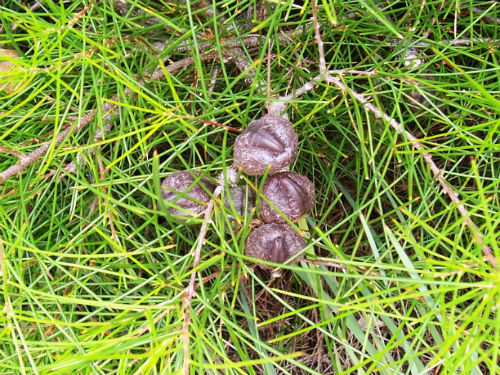 H. actites is similar in appearance to the better known H. sericea. The main difference is in the smoother surface of the fruit. H. actites also occupies wetter habitats than H. sericea. The specimen, in the photo, was growing in the North Coast Regional Botanic Garden, Coffs Harbour NSW. H. actites was named in 1996 by W. T. Barker from material collected near Angourie, a town on the North Coast of NSW. The species name is from the Greek and means coast-dweller referring to the regions where H. actites is found.